On Sale Now! Save 10% on the Pitch, Tweet, or Engage on the Street: How to Practice Global Public Relations and Strategic Communication by imusti at Translate This Website. Hurry! Limited time offer. Offer valid only while supplies last. 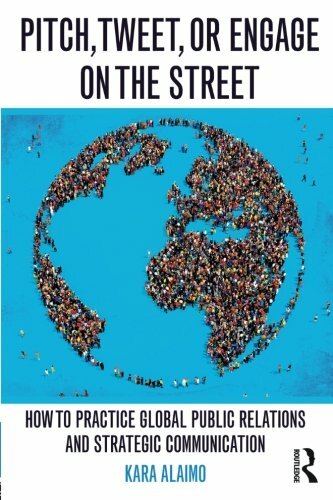 Pitch, Tweet, or Engage on the Street offers a modern guide for how to practice public relations and strategic communication around the globe. Pitch, Tweet, or Engage on the Street offers a modern guide for how to practice public relations and strategic communication around the globe. Drawing upon interviews with public relations professionals in over 30 countries as well as the author’s own experience as a global public relations practitioner in the United Nations and in U.S. President Barack Obama’s administration, this book explains how to adapt public relations strategies, messages, and tactics for countries and cultures around the globe. The book begins by explaining key cultural differences which require practitioners to adapt their approaches, before discussing how to build and manage a global public relations team and how to practice global public relations on behalf of corporations, non-profit organizations, and governments. Then, the book takes readers on a tour of the world, explaining how to adapt their campaigns for Asia-Pacific, Europe, the Middle East, the Americas, and Sub-Saharan Africa. Along the way, readers are introduced to practitioners around the globe and case studies of particularly successful campaigns – from a public relations "siege" that successfully ended an epidemic of violence in Kenya to the remarkable P.R. strategy adopted by Bordeaux wineries in China that led to a staggering 26,900 percent increase in sales.